Habit: Annual to perennial herb [to trees]. Stem: decumbent to erect, < 2 m, simple or branched. Leaf: simple, cauline, sometimes also basal, opposite or whorled, entire, sessile or basal +- petioled; stipules 0. Flower: bisexual, radial, parts in 4s or 5s except pistil 1; sepals fused, persistent; petals fused, +- persistent, sinus between lobes often unappendaged; stamens epipetalous, alternate corolla lobes; ovary superior, chamber 1, placentas parietal, often intruding, stigmas 1--2. Fruit: capsule, 2-valved. Seed: many. Genera In Family: +- 90 genera, 1800 species: worldwide; some cultivated (Eustoma, Exacum, Gentiana). Note: Gentianella tenella moved to Comastoma. Key to genera revised by Bruce G. Baldwin. Habit: Perennial herb (non-flowering rosettes preceding flower-stems, plants dying after flowering in Frasera albomarginata, Frasera parryi, Frasera puberulenta, Frasera speciosa, and Frasera umpquaensis; non-flowering rosettes appearing with flower-stems in others). Leaf: basal +- petioled; cauline opposite or whorled, < basal, base often fused-sheathing. Inflorescence: cyme or panicle of dense clusters. 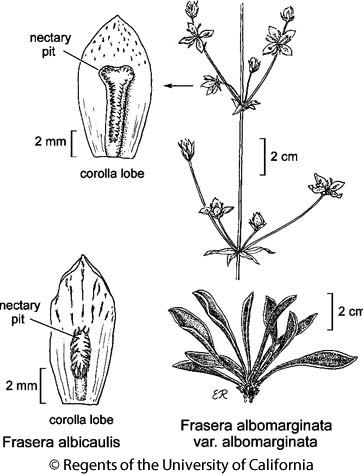 Flower: parts in 4s; calyx fused near base, lobes lanceolate; corolla rotate (bell-shaped), lobes >> tube, ridge between stamens fringed or scaled or 0, nectary pits prominent, 1(2) per lobe, margins of openings variously fringed; ovary sessile, style long and well differentiated or short and poorly differentiated, persistent, entire, stigmas 2. Habit: Plant 1--6.5 dm. Stem: 1--few; rosettes several. Leaf: narrowly white-margined; basal 4--23 cm, 3--12(20) mm wide, oblanceolate; cauline opposite, distal linear-oblong. Inflorescence: dense, interrupted proximally; pedicels 2--8(30) mm. Flower: calyx 3--7(12) mm; corolla 6--12 mm, green-white to pale blue, dark-blue-dotted or not, lobes elliptic-oblong, acute to short-acuminate, ridge between stamens with +- 2 mm, triangular to ovate-oblong, entire or +- coarsely jagged scales, nectary pit 1 per lobe, oblong. Bioregional Distribution: KR, NCoR, CaR, n SN, MP; Distribution Outside California: to Washington, Montana, northwestern Nevada. Note: Varieties intergrade; 4 other varieties. Synonyms: Swertia albicaulis (Griseb.) Kuntze; Leucocraspedum albicaulis (Griseb.) Rydb. Citation for this treatment: Bruce G. Baldwin 2012, Frasera albicaulis, in Jepson Flora Project (eds.) Jepson eFlora, http://ucjeps.berkeley.edu/eflora/eflora_display.php?tid=26069, accessed on April 22, 2019. KR, NCoR, CaR, n SN, MP; Markers link to CCH specimen records. Yellow markers indicate records that may provide evidence for eFlora range revision or may have georeferencing or identification issues. Purple markers indicate specimens collected from a garden, greenhouse, or other non-wild location.